Discovery Channel’s MythBusters has disproven (or, sometimes, proven) a wide variety of popular beliefs, internet rumors and other myths. It’s got to be rare, though, that an experiment they run actually ends up saving people’s lives. But, that’s exactly what happened to Theresa Booth of Saint Martin, Minnesota. She and her baby came close to drowning in their car on April 3, 2007, but the advice she remembered from a MythBusters episode helped her to survive. I hit a patch of slushy snow and went off into the water. Our car was filling up with water, it was happening so fast. I crawled through the vehicle, got into the back seat with Emily, unstrapped her from her car seat and I tried the driver’s side door — that door wouldn’t open. I had Emily in my arms trying to keep her out of the water and I’m going, ‘Oh my gosh, I need to get us out of here’ and then the MythBusters thing came to mind. I was like, OK, I have to wait. Even though I didn’t want to, I had to wait ’til the pressure equalized in the vehicle so I could get the door open. I waited until that moment, pushed the door open and it opened like nothing. I swam-walked and held Emily above my head to keep her out of the water and got onto the road. 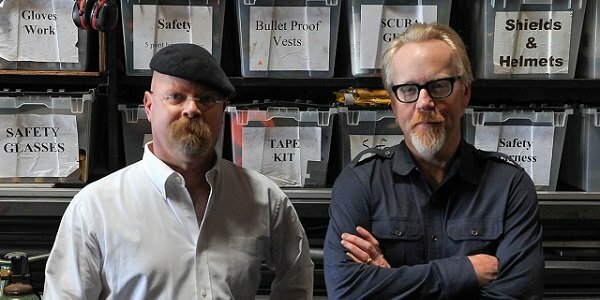 MythBusters will air its series finale this Saturday, and after the episode a reunion special will air, where the whole cast hear that an experiment actually saved lives. Entertainment Tonight got an exclusive look at the special. Hosts Adam Savage and Jamie Hyneman, along with former MythBusters experiment team members Tory Belleci, Kari Byron and Grant Imahara, watched a video during the reunion special where they got to see what impact their sunken car experiment had on Theresa Booth and her family on that fateful day nine years ago. The video of Booth telling her story is interspersed with scenes from the episode that helped to save her and her daughter’s life, as well as scenes of the family revisiting the site of the car accident. As is to be expected, the team is proud, but also very emotional upon hearing the account of events, with Kari Byron even wiping away tears after watching the video. You can take a look at the whole segment, below. The series finale of MythBusters airs March 5, at 8 p.m. ET/PT on the Discovery Channel.